eat, drink & be vegan: News! PCRM's 21-Day Kickstart! I haven't posted for a while, because I thought I'd be ready to launch my new website. With Let Them Eat Vegan in reprint (details soon), I've decided to continue developing the new site. For now, I'm hanging in with my little blog for just a while longer, and have some exciting news today! I am now a recipe contributor for PCRM’s 21-Day Kickstart! My recipes will appear in the Spring Kickstart program, which - kicks off! - on April 2nd. I am so excited about this opportunity. From my very early days as a vegan and writing cookbooks I followed PCRM and referred people to their site. And, Dr. Barnard wrote the foreword to eat, drink & be vegan, for which I will always be grateful. So, it is an absolute honor and privilege to contribute recipes to their program. If you aren't familiar with PCRM's Kickstart, link to find out more. And, speaking of recipes, I just recently added some to my recipes page. Link through to find Rawesome Nut Dip, Spicoli Burgers, and Lemon Chickpea Lentil Soup. So very exciting Dreena! You are amazing and it is wonderful that others will have a chance to find that out! Congratulations! What an honor for you! I love seeing their recipes and often thought that yours would do well with their program. I'm so happy for you!! What excellent news, Dreena! Congrats! Congratulations that is very exciting news. I am so glad that PCMR is doing so many great things! Congrats Dreena--I'm sure all of your recipes will be lip-smackingly healthy! 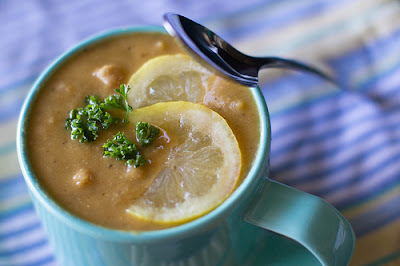 This looks savory & the lemon on the top is adding a different feel to the soup. Amazing. Congo Dreena !